Story: A bomb goes off in the Mongkok district and shortly afterwards an Emergency Unit van of the police vanishes along with all five policemen. Since the Police Commissioner is abroad at the time, in order to strengthen Hong Kong's reputation as Asia's safest city, M.B. Lee (Tony Leung Ka-Fai), Deputy Commissioner of Police Operations, leads the investigation. He is puffed up that despite the immense amount of budget invested in the technology department a crime like this is even possible and that the kidnapped policemen can't be found. He activates almost all police units and sets up operation "Cold War". Deputy Commissioner of Police Management Sean Lau (Aaron Kwok), on the other hand, believes that Lee's actions are unreasonable. He thinks that Lee's power of judgment is obscured since one of the kidnapped men is his son (Eddie Peng). A struggle for predominance unfolds between the two, while the kidnappers finally contact the police and demand a ransom. But soon it becomes obvious that the men behind the crime have a mole in the police force. Since this leads to an investigation within the own ranks the case takes on increasingly complex proportions and the kidnappers always seem to be one step ahead. Review: Action thriller "Cold War", which is highly glorified by the producers, is supposed to show the direction in which future Hong Kong movies should go. Let's hope that no one really listens because even though the thriller might undoubtfully be captivating at times it is on the whole a disappointing film. This is mainly because of an incredibly self-absorbed screenplay. Though at first it may present some good ideas the script turns out to become a lot weaker towards the end. Unfortunately, the two main characters aren't fleshed out that well either, but the experience of the two actors makes up for this shortcoming most of the time since Aaron Kwok's and Tony Leung Ka-Fai's screen presence is very tense at all times. Tense is also the right word for the rest of the film. Everything and everyone is incredibly tense and fired up, as if a bomb is about to blow up any time. Lee is imposing some kind of emergency rule to Hong Kong residents and we are actually just waiting for the city to be closed off and police or even better military forces to patrol the streets. But why exactly? Because a van with policemen has been kidnapped... Surely, this is no trivial offense, yet we wonder whether this really justifies to give an unarmed man a headshot during a police raid at the harbor. And why does no one at the police need to have to answer for such actions? Deputy Commissioner of Police Operations Lee constantly looks like a capricious individual and so we can't blame Lau for wanting to divest him of office. That's also what the first half of the movie revolves around. 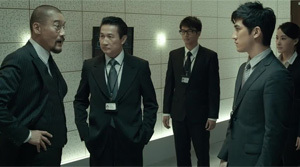 The rivalry between Lau and Lee is thrilling and captivating thanks to Aaron Kwok's ("After this Our Exile") cold and analytical portrayal of the police management deputy and Tony Leung Ka-Fai's ("Tai Chi Zero") embodiment of the police operations commissioner who always seems to be one step away from going off. However, that's also where all too often the big problem of the movie becomes apparent as well, which especially later on constantly lowers the entertainment level of the story. The tension is only found at the surface. The screenplay surely isn't bad, but from the second half onwards the story extremely sags and it becomes obvious at all times how pretentious and self-absorbed "Cold War" really is. Eventually you can only roll your eyes about the tense atmosphere and the artificially bloated tension in general. Responsible for that is most of all the soundtrack by Peter Kam ("Perhaps Love", "Wuxia"), which on its own may be composed well, but simply doesn't fit to this movie. That is since the soundtrack only knows one direction: bombastic. Lau walks along a corridor, nerve-racking music, Lau reads a few files, adrenaline-pumping sounds, Lau talks with some, the speakers of your TV set are vibrating because of musical tension. Luckily, it's a fact that only the most inexperienced of viewers will actually be manipulated that easily. The more desperate the two directors try to make the film look thrilling the more boredom is actually spreading. Directors Longman Leung and Sunny Luk deliver their debut work here. Their screenplay is partly well written and offers complex embroilments, in the end it's just another simple story around betrayal and power, though. Still, the movie's pictures do look really astonishing, especially the sets are all very nicely chosen and give everything a classy look. Thus, "Cold War" is maybe the most visually appealing Hong Kong thriller to date, if it's a polished, expensive look you are after. Apparently, there weren't any cheapskates working in the production department. But even though there may be some action scenes towards the end, "Cold War" in fact remains a dialogue-heavy thriller, that focuses on its story, and since especially the ending turns out to be unnecessarily emotional, including a hint at a possible sequel, there is just disappointment remaining in the end. Surely "Cold War" is not a bad movie, but by no means it is the future of Hong Kong cinema.